An outdoor exhibit was designed and installed at The Morton Arboretum to highlight that some of the trees that we know and love are endangered in the wild. The exhibit was produced in partnership with the Global Trees Campaign and demonstrates that by protecting these trees we help ourselves and the entire planet. The exhibit explores the uses of and threats to a number of threatened trees, including the wild apple Malus sp. ), Pacific yew (Taxus brevifolia, NT but with a declining population) and the Fraser fir (Abies fraseri, VU). Exhibit viewers are invited to embark upon a global journey exploring 15 compelling tree stories from around the world. Each story reflects the exhibit’s primary theme – that we must protect and save endangered trees so that future generations may experience their numerous benefits, including medicinal, agricultural, ecological and aesthetic values. Exhibit panels include world maps showing the species distribution, and engaging stories about vital conservation efforts. Exhibit viewers will find simple, specific action steps to promote tree conservation efforts, including planting trees, supporting organizations that plant and protect trees, and sharing what they’ve learned with others. Vanishing Acts was shown at the Morton Arboretum in 2012 and subsequently toured other botanic gardens across the United States. In early 2012 an agreement was signed between the GTC, Beijing Botanical Garden and The Morton Arboretum to translate ‘Vanishing Acts: Trees under Threat’ into Chinese. 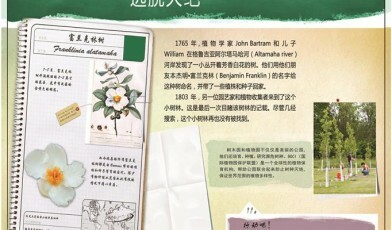 The Chinese version was completed and launched by Beijing Botanical Garden in spring 2013. The electronic file of the panels was distributed to over ten Chinese botanical gardens which had shown interest in exhibiting the displays. These include Chongqing Nanshan Botanic Garden, Shanghai Chenshan Botanic Garden and the Hunan Forestry Botanic Garden. The exhibit continues to raise awareness of the importance of tree conservation and the value the threatened species documented in the exhibit hold to humans.